I look great in a container! 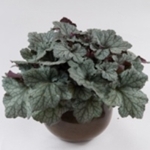 Heuchera 'Kira Alpine Forest'. Compact clumps of dark green foliage overlaid in silver. The rounded leaves are multi-lobed and fuzzy. Light pink flowers are displayed on cherry-chocolate scapes (stems) which happen to match the cherry-chocolate undersides of the foliage. A good candidate for container growing. PPAF.